Signs of spring are finally starting to appear here in southeastern Pennsylvania. Just yesterday morning, I heard the pre-dawn twitterings of the first woodcocks as they migrate through here in March, and new shoots are popping up even through the soggy soil. Still, it’s going to be a while yet before there’s a lot of color to enjoy outside, so I decided to delve into my photo archives to get some ideas for combinations that I may want to revisit, and I’ve selected a bunch of my favorites in the hopes that they may help to brighten your day too. 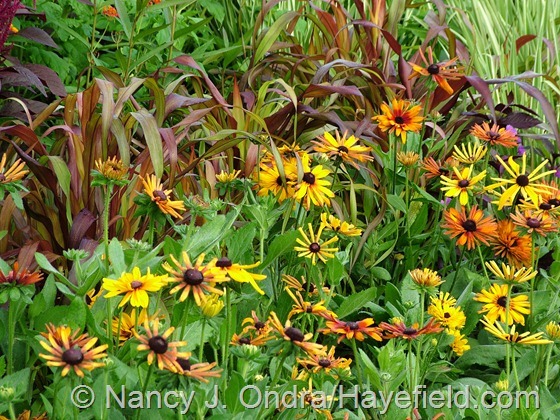 They cover a range of color themes, but they all have one thing in common: one or more annuals or tender perennials as the stars of the scene. There are a lot of them, so I’ll show just the summer combos here and save the fall and foliage pairings for follow-up posts.